Several area attractions offer both indoor and outdoor experiences so if the occasional pop-up rainstorm happens (and our apologies because Innkeeper Brigette requested some of the rain for her garden plants), then you can be inside and stay dry until the sunny skies return. One such place is the North Carolina Arboretum, located just southwest of Asheville, near the Blue Ridge Parkway. Not only does the NC Arboretum have several nature trails and gardens on 434 acres, but there are indoor exhibits as well. From now through mid-August, you can see two exhibits: Balance and Beauty: A Visual Celebration of Rural Life features the work of artist Margaret Scanlan from Tennessee in the Arboretum’s Baker Center, while in the Baker Exhibit Greenhouse, Living Color: A Color Study Illustrated with Plants is a learning exhibit showcasing a color wheel made of flowering plants. That sounds pretty cool. 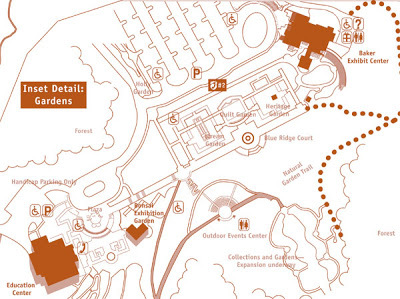 Also, starting this month, the Education Center at the Arboretum will house an exhibit called Art in Bloom. From June 5 through July 25, you can see floral paintings by artist Marjorie Renfroe, who also writes nature poetry. To see these great indoor exhibits, you need only to pay the nominal parking fee, which goes toward making the North Carolina Arboretum the fabulous and enjoyable place it is. And if it’s sunny while you’re there, be sure to note the outdoor botanical sculptures by Elizabeth Scofield and Jason S. Brown, now on display through next February. This entry was posted in Uncategorized and tagged Asheville, flora and fauna, NC Arboretum, Summer by Inn on Mill Creek. Bookmark the permalink.